The parent and young child relationship is explored in this simple story of a baby sea otter and its mother. The way the baby and mother spend their days is together, and that’s what the story is called: Together. The sea otters spend their time watching the sun rise and the clouds float by, playing and laughing, sharing and learning new things. All their fun is told in rhyming text and as the activities enjoyed together are shared, the pictures move between those above water and those that show what’s happening below the surface. Readers can see the baby floating on the top of the water while mum dives below, and reflections of mum and baby as they frolic by the edge of the water. The illustrations make particular use of lines (reeds, waves in the water, and in the sky as the sun sets) and of colours, particularly silver (in the water), pinks and oranges (in the sky) and blues and greens (the water, greenery and sky). It combines to have a rather calming effect. 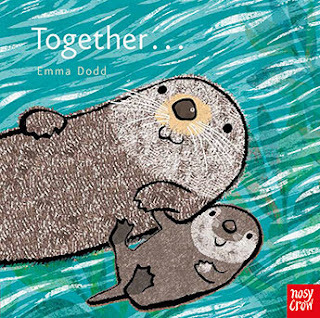 Together is a beautiful book for parents to read to babies and toddlers at anytime, and would make a particularly great bedtime story.